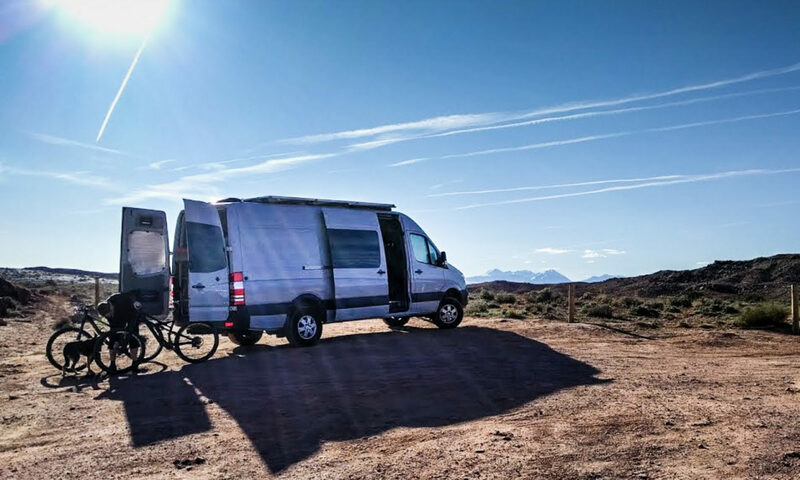 Our van will have different ‘zones’ inside – a garage area for bike storage, a bed area, a living area and a driving area. One way to differentiate these is by changing the wall covering in each area. The garage area will have rubber coin mats for both the floor and walls, up as far as the first run of l-track just under the windows. 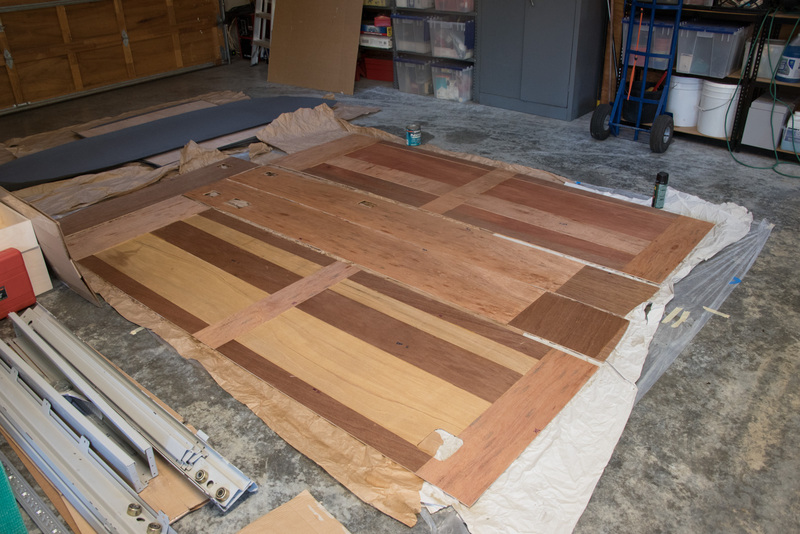 The rubber coin mat will continue forward on the floor, but the front of the van will use bamboo for its walls. Above the coin and bamboo, we’ll use strong Olefin fabric called “interweave” or church pew fabric. It’s very durable and stain resistant. This will continue on up to the ceiling. The l-track gives us a 1/2″ flange to slide wall pieces behind. For the coin, that’s easy enough – 1/2″ ply for a sturdy wall, with coin glued on top. For the bamboo, which is 1/4″ three-ply strips, we just have to glue a 1/4″ plywood spacer behind it to reach the 1/2″ depth. For the fabric, things get a little more complex. Above the first piece of l-track, the walls start to curve in quite quickly. 1/2″ thick plywood wouldn’t take the curve well. Instead, we’ll use a 1/4″ thick plywood base, with 1/8″ Low-E insulating foil/foam behind it, and 1/8″ closed cell foam glued in front as padding for the fabric to stick to. This sandwich compresses nicely to 1/2″ thick. 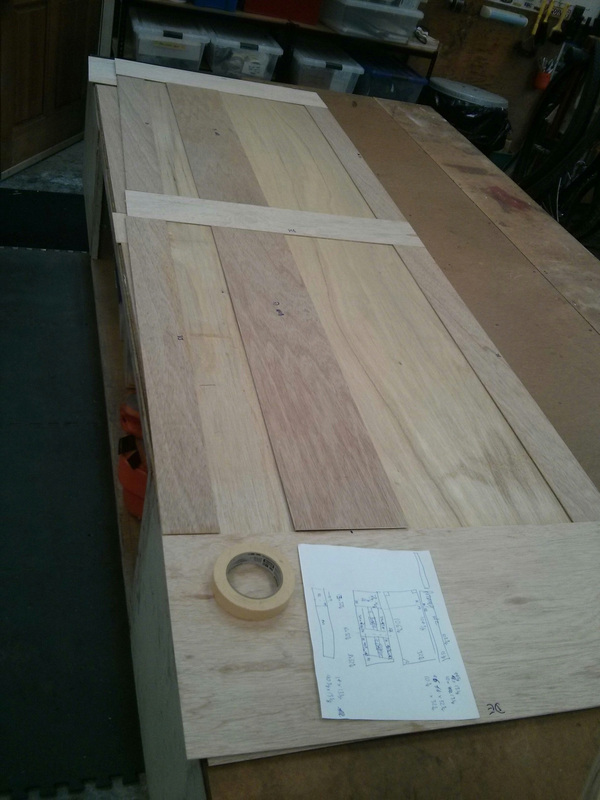 You can’t easily buy sheets of plywood that are over 8′ long. We needed to span a 9′ area. Some people use two panels to do this, but we didn’t want a gap. For that reason, we used 1/8″ plywood and constructed a staggered joint between the front and back panels. In fact, there was no real need to even use a complete sheet for the back panel. It just needed to exist at the edges and where things like the bed platform support rails will bolt through it. Overall, it’s not clear that the weight saved by doing this was worth the extra hassle, but it was an interesting exercise to cut all the pieces out and glue them together. Hopefully the cut-out sections will also make it easier to bend this piece to shape along the wall. We have varnished the back side of the plywood to give it some protection against moisture and humidity in the van. The front will have a water-resistant layer of foam glued solidly on. The top of the main panels is also held in place by l-track, then there’s a final, thinner panel up to the roof. Using the l-track meant we didn’t need visible fasteners along the wall edges. The ones we use at the top of the thin topmost panel and at the edges of the ceiling panels will be hidden by a moulding that also contains LED strip lights. What is the moulding that you are using that contains LED strip lights? Thanks! Gabe, you can read all about the ceiling coving in this post. We used pieces of aluminum siding trim that we had lying around, but wood battens would work just as well. Thanks for providing so many details, your site is amazingly helpful. Are all the wall panels secured by the I-track flanges alone, or are there a few anchor points directly to the van frame (to avoid rattle)? Also- did you just slide them in behind the I-track or did you connect the I-track into the rivnuts during wall hanging process? Thanks! Oren, All the wall panels are held in place by the L-track flanges. The base panels are also screwed into the wall just above the floor. The topmost panels are held against the wall at the top by the ceiling panels, and those are screwed into the ceiling beams near their edges too. The wall panels do not rattle. We tightened the flanged L-track into place with the panels already installed. Because there’s a layer of foil-faced foam behind the wall panels, the flanges press quite hard against the wall panels, so there’s no way we could have slid them in. I’m in the process of building out the walls and am curious about how you got to 1/2″ thickness for the upper walls. You mention the low-E foam in the assembly, but it’s unclear if this is the the low-e taped over the thinsulate or if it is an additional layer of low-e glued to the 1/4″ board sandwich. Also, did you wrap the foam over the edges of the wood, or just the fabric? Looks like just the fabric in most of the pictures, but a little hard to tell. Thanks again, incredibly helpful site!! Oren, the Low-E layer is just what’s taped over the Thinsulate. It forms a layer on top of the metal walls inside the van. Moving towards the inside of the vehicle from that layer, there’s 1/4″ of plywood (two layers of 1/8″ laminated together), then the closed cell foam glued to the plywood, then the fabric glued to the closed cell foam. We found that this built up to a sufficient depth that the walls were held in place by the flanged L-track just fine. We did not wrap the foam around the edges of the plywood. We cut it flush with the edges and then just wrapped the fabric around to the back of the plywood. That seems to have created smooth enough edges at the places where they show. Good job deducing what you did from our pictures. I hope what I’ve just added helps you to get your walls built.